Adding visual and textural interest to a landscape design can be done in a variety of ways. One method is through the use of vining plants such as ivy. In the past and traditionally used in English gardens, today’s landscape designers are finding lots of use for ivy, whether small, medium, or large-sized vines. .
Don’t stop with visualizing ivy-covered brick walls and cottages; ivy does not have to be limited in the ways that it can be used. Since it grows abundant vines, it can be used to vertically garden where other plants might not work. 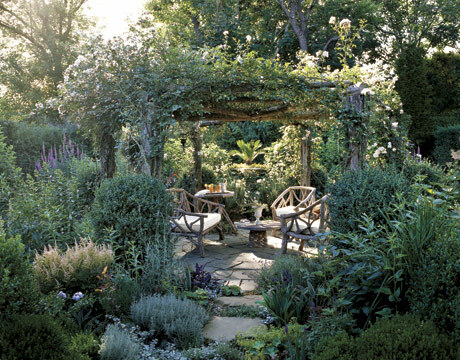 Use your imagination – with ivy you can create an extravagant, beautiful space all your own in your yard. Ivy is able to climb up anything, anywhere that you choose. The roots are hardy, and if you set up just an ordinary trellis against a wall and wrap lattice strips around the branches, you can create a unique pattern with the green vines. Ivy also makes a great cover for arbors and pergolas, providing shade as well as visual appeal. It can be an elegant addition to the garden that you have, and there are many spots around your yard that its touch of green would be at home. Imagine cascades of green over a high retaining wall or fence. Ivy grows aggressively, so you may have to trim it at times when it becomes unruly, but it is easy to do and the ivy takes well to it. You’re even able to create passage ways by creative trimming once it grows out around the doors and windows of your home if it’s planted next to your house. With ivy you’re also able to disguise unsightly things in your yard using such as gas pipes and other less-than-attractive structures. Smaller varieties of ivy work great for container plantings. You can place the ivy in pots, bowls or on pedestals to create a different look. There are different types of ivy that you can get too, some with small beautiful leaves on them. You can use them in flower beds or to create borders. This provides a slight shading and gives the landscape a more unique look. Ivy is versatile and anything but boring! Ivy is just one of the many natural plantings that can find a home in your landscape. If it’s time for your yard to get a makeover, give us a call today to talk about how we can incorporate ivy into your yard when the weather warms up and you’re looking for a little boost outside. Call us at 952-292-7717. We are a Minneapolis-area landscape design firm specializing in bringing landscape dreams to life!